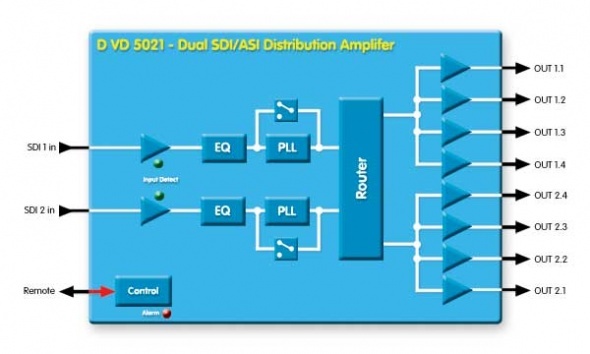 Featuring dual mode operation with clocked or non re-clocked operation the D VD 5021 is a versatile solution for SDI / ASI distribution applications within any system. The D VD 5021 can be used as a single 1>8 or a dual channel 1 > 4 device. Each channel can be independently clocked or non-reclocked. This module is ideally suited for demanding high quality broadcast and professional video applications. In re-clocked mode the module will auto-detect standard video bit rates (143, 177, 270, 360 and 540Mbits/s) and transparently pass data from 10Mbits.s to 640Mbits/s when set to non-reclocked mode.The module is also supports ASI / DVB and SMPTE 310 signals. Microprocessor control and on board flash ram enable configurations and settings to be stored within the module (through power cycles and module removal). Local control capability is provided via the integrated dip switch and multifunction switch. Remote control, status monitoring and SNMP error reporting is possible when using the LYNX control system.